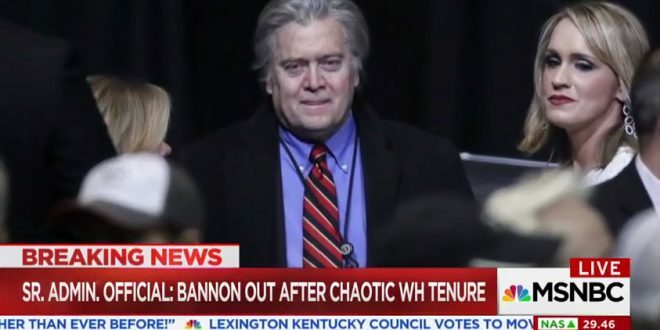 PAYBACK LAUNCHED: Steve Bannon Declares "The Trump Presidency We Fought For, And Won, Is Over" - Joe.My.God. Bannon says that he once confidently believed in the prospect of success for that version of the Trump presidency he now says is over. Asked what the turning point was, he says, “It’s the Republican establishment. The Republican establishment has no interest in Trump’s success on this. They’re not populists, they’re not nationalists, they had no interest in his program. Zero. It was a half-hearted attempt at Obamacare reform, it was no interest really on the infrastructure, they’ll do a very standard Republican version of taxes.